I hope you're all keeping well! Today my blog post is taking a slightly different turn as today, I'm going to be using my blog to do something that normally I wouldn't do, I'm using my blog to try to raise both awareness and money for a cause close to my heart. My 8 year old sister Honey (pictured below) is trying to raise money to help the SEN department at her school purchase sensory equipment to benefit the children with SEN needs at her school as the school have said that at present they don't have the money to purchase the equipment. It's heart breaking to know that due to a lack of funding, children will being going without equipment that would make their day-to-day school life so much less overwhelming, giving children with SEN needs a safe space in school that caters directly for their needs; which is why Honey has taken it upon herself to raise the £500 that the school need by the end of the summer holidays. 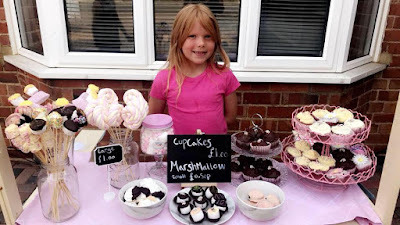 Alongside the online fundraiser, over the summer holidays Honey will be fundraising "On the Ground" by running "Honey Bun's" a homemade cake stall outside of our house, which in it's first day alone made £31. Honey really is a a hard working and determined young lady and would love it if you would support her and help her reach her goal. I would never normally use this platform to ask for donations, however this is such an important cause that I felt that I needed to share it. Any donation is warmly received however if you can't donate, please share this post as it may bring it to the attention of someone who can. Let's help Honey reach her goal! As always thank you for taking the time to read my blog.